The zoomable image shows the cross-section through the tongue of a rabbit. 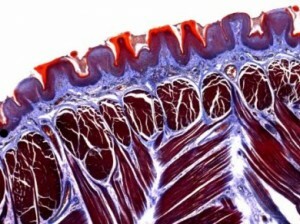 The muscle fibers are stained red-brown. The structures at the top of the image (bordering the white background) are the taste buds. The striations (light and dark bands) are not visible due to the lack of resolution.